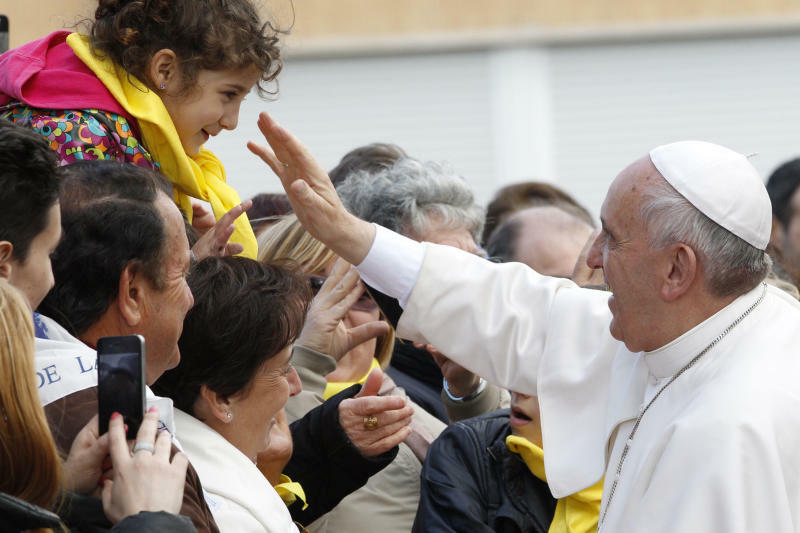 ROME (AP) — Pope Francis washed the feet of 12 disabled and elderly people Thursday — women and non-Catholics among them — in a pre-Easter ritual designed to show his willingness to serve others like a "slave." Francis' decision in 2013 to perform the Holy Thursday ritual on women and Muslim inmates at a juvenile detention center helped define his rule-breaking papacy just two weeks after his election. It riled traditionalist Catholics, who pointed to the Vatican's own regulations that the ritual be performed only on men since Jesus' 12 apostles were men. But as archbishop of Buenos Aires, Cardinal Jorge Mario Bergoglio frequently performed the ritual on women — a practice that he seems intent on keeping up now that he is pope. The 2014 edition brought Francis to a center for the disabled and elderly in Rome. 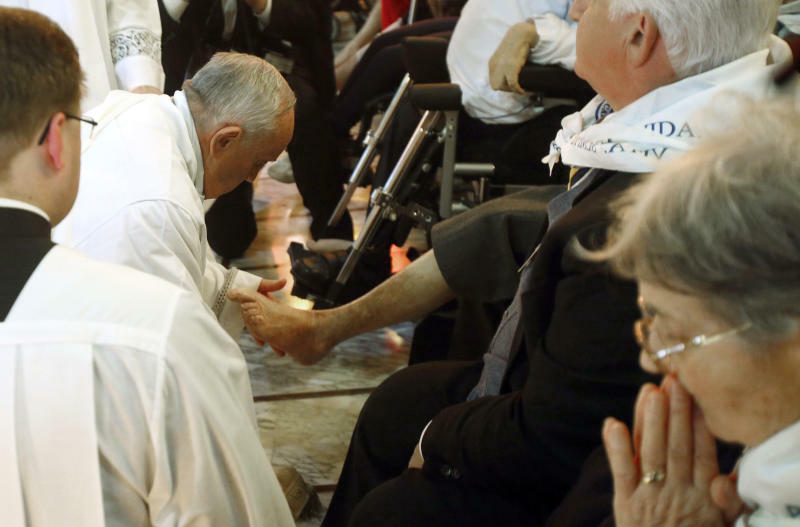 Francis kneeled down, washed, dried and kissed the feet of a dozen people, some in wheelchairs, some with grossly swollen and disfigured feet. The Vatican didn't release the exact breakdown of their religious backgrounds, but said they came from various religious confessions. Italian news reports said one was a Libyan Muslim and four were women. Francis told the faithful that he was performing the ritual to remind himself how to serve others, as Jesus did when he washed the feet of his apostles. "Jesus made a gesture, a job, the service of a slave, a servant," he said. "And he leaves this inheritance to us: We need to be servants to one another." Francis began Holy Thursday by presiding over Mass in St. Peter's Basilica celebrating the priesthood, the start of a busy four days of Holy Week commemorations and preparations for next week's canonization of Popes John Paul II and John XXIII. 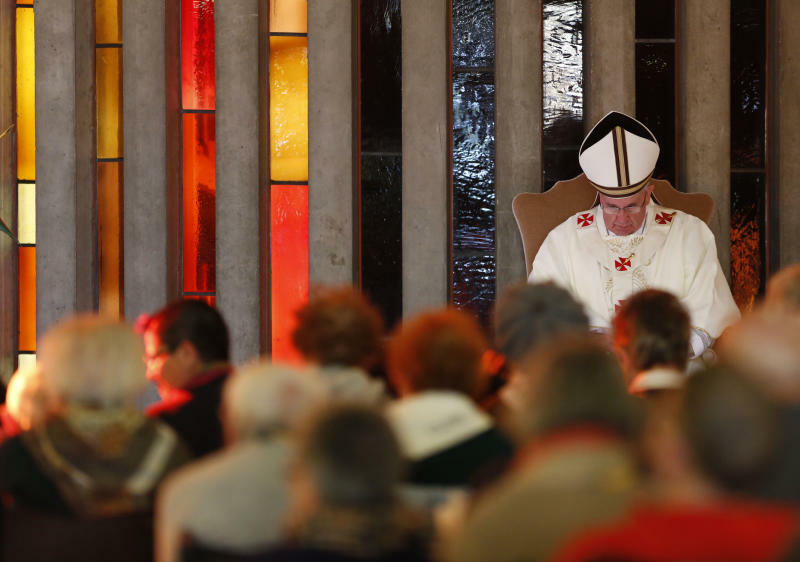 During his morning homily Thursday, Francis urged his priests to exhibit joy, though he admitted that he too had suffered "moments of listlessness and boredom which at times overcome us in our priestly life."